In 1666, La Salle first stepped on the soil of New France - his home base for the next twenty years. La Salle was born and educated in France, and under the aegis of the church had taught until 1666. At the age of 23 a desire for the life of adventurer, explorer and trader in the New World brought him to Montréal. Upon arrival, he obtained a grant of land at La Chine - a name ironically derived from his lifelong effort to find a western passage to China. But La Salle was too restless to settle permanently, and soon began the series of exploration trips that were to lead him ultimately to the mouth of the Mississippi. In 1669, a fur trading and exploration mission took him to the Ohio River. In 1673, La Salle was appointed by Frontenac, the Governor of New France, to supervise the building of Fort Frontenac, which occupied the site of present-day Kingston. Later he obtained the command of this fort, and on a trip to France in 1677, he brought back settlers and artisans to assist in the development of Fort Frontenac. During these years, he obtained a monopoly of the fur trade in the Mississippi valley, and in 1672 began his search for the mouth of the Mississippi. In 1682 he reached his goal, and was made governor of this new territory of "Louisiana" by the French Government. Throughout his career, La Salle was plagued with bad luck. In 1679, for example, the ship "The Griffin", bearing a cargo of furs from Green Bay, Wisconsin, and which was intended to pay La Salle's creditors at Montréal, was lost. La Salle was constantly worried by merchant rivals, who resented his monopoly, and by the English, who feared encirclement. In 1689 occurred another - and final - burst of bad luck. On a return expedition from France, he proceeded too far west, and missed the mouth of the Mississippi. On an overland attempt to reach home, René Robert Cavalier, Sieur de la Salle was assassinated by one of his own men. 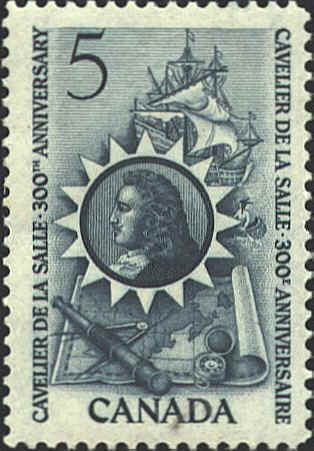 The stamp honouring the adventurer and explorer was designed to feature a rendering of La Salle against a background of the symbols of his life's work. Of large size and vertical format, the stamp pictures a map of seventeenth century Canada, a spyglass, ship, and La Salle himself. Designed by Brigdens Limited, a Toronto graphic arts firm, it has been steel line intaglio engraved by the Canadian Bank Note Company in tones of green.